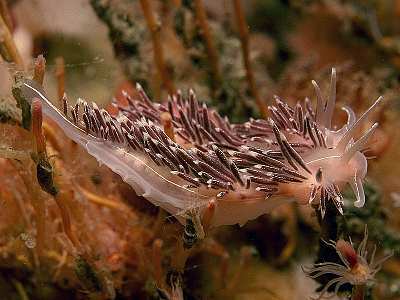 MOLLUSCA : NUDIBRANCHIA : SNAILS, SLUGS, ETC. Description: The body is translucent white in colour with lines of opaque white pigment on the long, pointed oral tentacles, joining between the rhinophores and running down the centre of the back. There are similar white lines on each side of the body, below the notal ridge where the cerata are attached to the body. The cerata are filled with red-brown, red or yellow digestive gland, and have linear dashes of white pigment arranged as irregular lines on the surfaces. There is little white pigment towards the tips of the cerata and the large cnidosacs are not obscured by white pigment. There are conspicuous pointed propodial tentacles at the front corners of the foot in all Coryphellids. Typically about 20mm-30mm in length, but well-fed individuals may be larger, up to 60mm. Habitat: Found mostly in places with moderate to high water movement which can be current or wave action. Steep rocky surfaces in shallow water on exposed coasts and hard substrata, including wrecks, ropes and artificial structures in tidal streams. Ecology: Feeds on the hydroid Tubularia indivisa as adults and on hydroids with smaller polyps as juveniles. Distribution: Currently known from southern Norway to Croatia including all of Great Britain and Ireland. Similar Species: Previously confused with Fjordia lineata which differs in having continuous white lines on the cerata which expand into a ring at the tips, partly obscuring the cnidosacs. Picton, B.E. & Morrow, C.C. (2016). Fjordia chriskaugei Korshunova, Martynov, Bakken, Evertsen, Fletcher, Mudianta, Saito, Lundin, Schrödl & Picton, 2017. [In] Encyclopedia of Marine Life of Britain and Ireland.